Biblical play by Isaac de Matatiah Aboab. Amsterdam, 1686. Comedia / de la vida y sucessos / de Josseph / llamado el Perseguido dichozo / Relacion muy agradavel / en que se Refieren / Todas las tragedias y Grandezas / que por dicho. 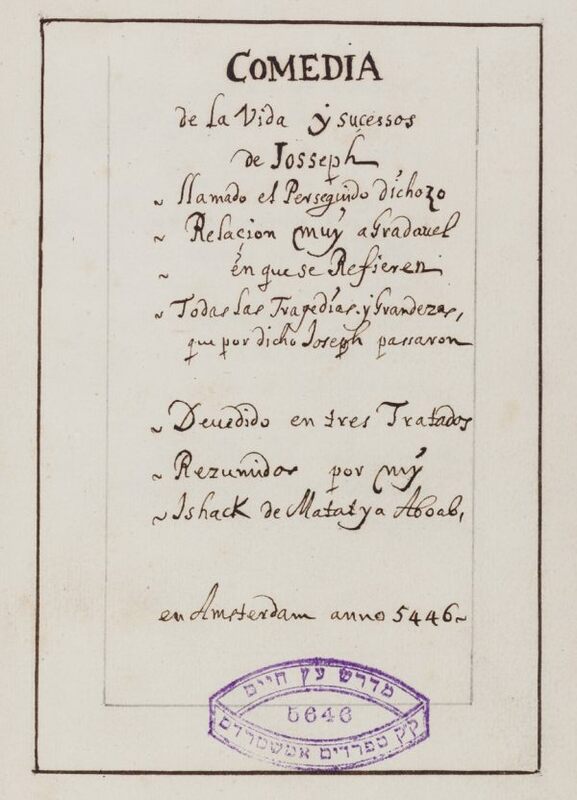 Joseph passaron / Devedido en tres Tratados / Rezumidos por my / Ishack de Matatya Aboab, / en Amsterdam anno 5446. Contents: f. [5r]: Title page. Usually, this play is simply known as El Perseguido dichozo (“Harassed but Happy”, according to Michael McGaha’s translation). McGaha supposes that Aboab wrote this play for performance in conjunction with the celebration of Purim or another Jewish holiday. Because of its length it may, alternatively, have been intended merely for reading rather than performance. Its Spanish is eloquent but contaminated by Portuguese, the author’s native language. The play reveals Aboab’s familiarity with the work of Spanish writers as Garcilaso de la Vega, Luis de Góngora, Miguel de Carvajal or Lope de Vega. McGaha also points out that, although the structure and versification of the play are awkward and amateurish by comparison with other comedias of the Spanish Golden Age, its plot is highly original and admirable, effectively using dramatic irony. Michael D. McGaha, The Story of Joseph in Spanish Golden Age Drama, Lewisburg, Bucknell University Press, 1998, pp. 226-232. There is another copy of this work in EH 48 E 1 and EH 49 E 2. Purchased in 1899 from the collection Henriques de Castro, cf. Catalogue de Castro, nr. 493, p. 51. Spanish, Paper, 19,3 x 15,1 cm. /  + 156 ff. (first 4 and last 6 ll. blank) / 18-20 lines to a page / Neat current Ibrian writing (autograph) / Contemporary gold-tooled leather binding stamped on the front: “Comedia de Josseph” and on the back: “Matatya Aboab anno 5454”. Fuks 302. Fundação Calouste Gulbenkian.